Hi, Ho, Hi, Ho . . .
It’s off to work I go, again. About 10:30 AM I headed over to the Alvin area to deliver the new Dell laptop and HP printer to my client. After getting everything set up, I finished the install of the UPS software and got it verified online. Next I got the new Zebra Label printer set up as well as the new HP 2542 Deskjet. 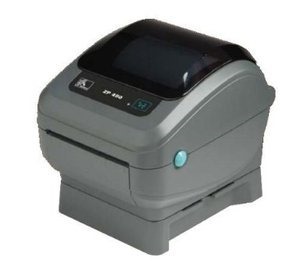 The Zebra printer is used to print the actual shipping labels that go on the packages, and the HP Deskjet prints out the invoices and reports. After everything was configured and working, I then got the Dell laptop set up on their Wi-Fi network, and the HP talking wirelessly to the computer. Unfortunately the Zebra is wired only. It’s always better to get everything working first, before trying to configure the Wi-Fi part of things. Last up, I tried to move the data from the old UPS machine to the new setup. But quickly found a problem. The old program exports the data in a form that the new program won’t accept. That’s the problem trying to upgrade from the 2009 UPS software to the 2014 version. Things have changed too much in the meantime. Since it was getting late, I’ll have to come back tomorrow and get on the phone with UPS Tech Support to see if there’s a way to convert the data and move it over. Leaving the client’s, I stopped by the Doctor’s office to get some info on Jan’s prescriptions from this past Tuesday. I’m beginning to think that the pharmacy may have given her the wrong pills which resulted in the $245 charge. But as it turned out, their computer system was down and they won’t be able to give me a copy until tomorrow. Next it was on to yesterday’s client to double-check that their new UPS software was working OK. While I was there we talked about installing a new printer, which I will probably do tomorrow. Finally about 4:30 I headed back to the rig, getting home around 5 PM. Later, Jan and I headed back into Clear Lake to meet our friend’s Bob, Maria, and Connie at King Food for dinner. We’ve known Bob and Maria since the mid 80’s and Connie since the late 90’s, and always try to get together several times while we’re back in the area. After a great meal, and two hours of catching up, and Jan trying to stay awake, we said our goodbyes and drove over to Chris’ to pick up our mail. And Amazon has done it again. Originally my new Kindle Paperwhite was supposed to be here the week of the 6th to 10th of January. Then it was Saturday, the 4th. Yesterday they said it had shipped and would be here Friday the 3rd. But as it turns out, they shipped it Next Day, and it came today, the 2nd. On another note, I found myself following this minivan this morning and got this photo. 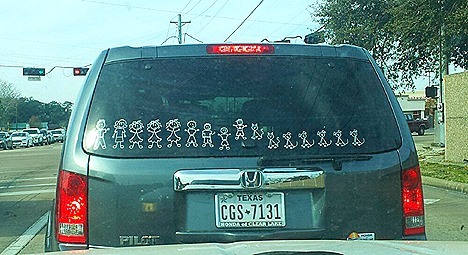 Either the 19 Kids and Counting family is in town, or this the modern version of a clown car. I count Daddy and Mommy, 3 girls, 4 boys, 2 cats, and 5 dogs. Looks like each kid has their own pet. I kind of wanted to follow them to see how many get out. Finally, I’ve post an new entry on how the dastardly Wal-Mart corporation is once again cheating consumers. This time by giving too much of something, or maybe not enough of something. I’m not quite sure which. And I don’t really think I want to know. You can check it out here at What Where They Thinking. During the American Revolution era, it was not unusual for a person to own his own cannon. I know Nick and I both want one.